I repeated the sysbench update-only test after reducing the InnoDB buffer pool to 1G. The test database is 16G so the test should be IO-bound. 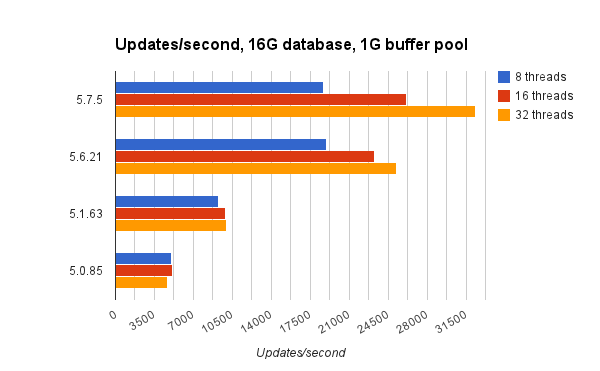 MySQL 5.7.5 is 10% worse than 5.0.85 at 1 thread and much better at 8+ threads. The previous blog post has more details on the setup. The configuration is not crash safe as the doublewrite buffer and binlog are disabled and innodb_flush_log_at_trx_commit=2. This test continued to use direct IO for InnoDB but this test requires a high rate of reads from storage. The previous test did many writes but no reads. A fast flash device is used for storage. 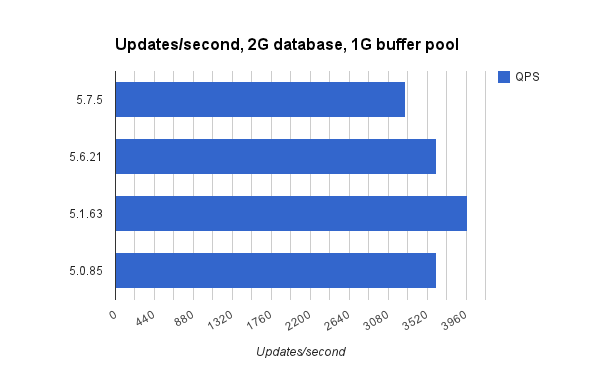 Only 1 table is used so there is a 2G database and 1G buffer pool. This test is less IO-bound than the many threads tests reported in the next section. Two graphs are displayed below. The first has the updates/second rates and the second has the rates normalized to the rate from 5.0.85. MySQL 5.7.5 is about 10% worse than 5.0.85 and all servers do between 3000 and 4000 updates/second. These tests uniformly distribute clients across the 8 tables. MySQL 5.7.5 is the best at 16 and 32 threads. MySQL 5.0.85 and 5.1.63 saturate at 8 threads.